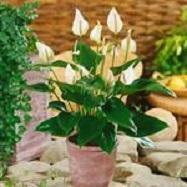 Beautiful plant featuring brilliant white upright flowers with green, yellow/white spadixs. Large decorative green upright foliage. Full sun to part shade.